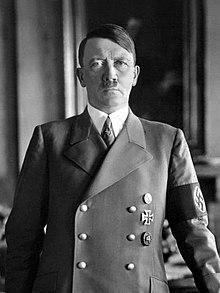 Adolf Hitler (German: (listen); 20 April 1889 – 30 April 1945) was a German politician and leader of the Nazi Party (Nationalsozialistische Deutsche Arbeiterpartei; NSDAP). 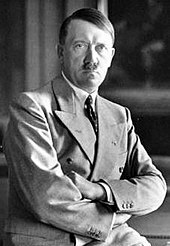 He rose to power as Chancellor of Germany in 1933 and later Führer ("Leader") of the German Reich and People in 1934. 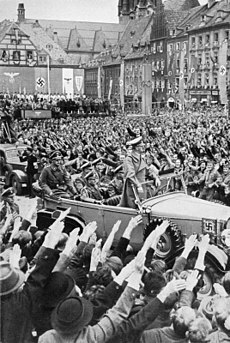 During his dictatorship from 1933 to 1945, he initiated World War II in Europe by invading Poland in September 1939. He was closely involved in military operations throughout the war and was central to the perpetration of the Holocaust. 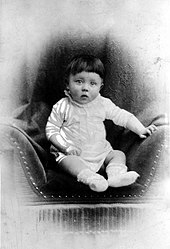 Adolf Hitler (German: [ˈadɔlf ˈhɪtlɐ] ( listen); 20 April 1889 – 30 April 1945) was a German politician and leader of the Nazi Party (Nationalsozialistische Deutsche Arbeiterpartei; NSDAP). 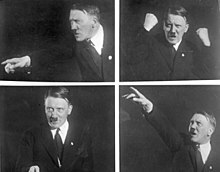 He rose to power as Chancellor of Germany in 1933 and later Führer ("Leader") of the German Reich and People in 1934. 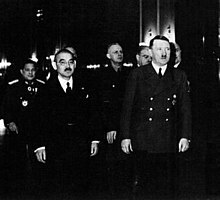 [lower-alpha 1] During his dictatorship from 1933 to 1945, he initiated World War II in Europe by invading Poland in September 1939. He was closely involved in military operations throughout the war and was central to the perpetration of the Holocaust. Under Hitler's leadership and racially motivated ideology, the Nazi regime was responsible for the genocide of at least 5.5 million Jews and millions of other victims whom he and his followers deemed Untermenschen (subhumans) or socially undesirable. 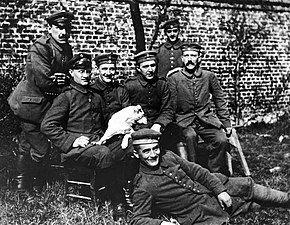 Hitler and the Nazi regime were also responsible for the killing of an estimated 19.3 million civilians and prisoners of war. In addition, 28.7 million soldiers and civilians died as a result of military action in the European theatre. 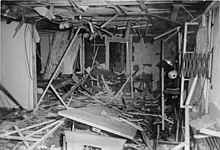 The number of civilians killed during World War II was unprecedented in warfare, and the casualties constitute the deadliest conflict in history. Alois had made a successful career in the customs bureau, and wanted his son to follow in his footsteps. 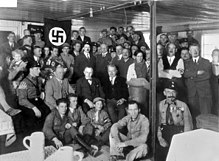 Hitler later dramatised an episode from this period when his father took him to visit a customs office, depicting it as an event that gave rise to an unforgiving antagonism between father and son, who were both strong-willed. 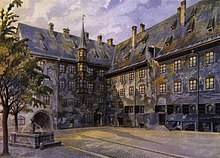 Ignoring his son's desire to attend a classical high school and become an artist, Alois sent Hitler to the Realschule in Linz in September 1900. 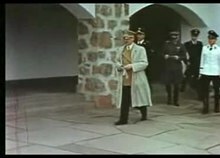 [lower-alpha 2] Hitler rebelled against this decision, and in Mein Kampf states that he intentionally did poorly in school, hoping that once his father saw "what little progress I was making at the technical school he would let me devote myself to my dream". 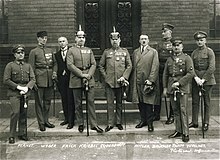 In June 1921, while Hitler and Eckart were on a fundraising trip to Berlin, a mutiny broke out within the NSDAP in Munich. Members of its executive committee wanted to merge with the rival German Socialist Party (DSP). 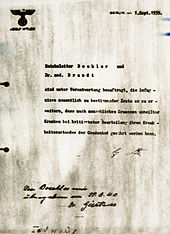 Hitler returned to Munich on 11 July and angrily tendered his resignation. The committee members realised that the resignation of their leading public figure and speaker would mean the end of the party. 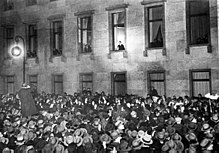 Hitler announced he would rejoin on the condition that he would replace Drexler as party chairman, and that the party headquarters would remain in Munich. The committee agreed, and he rejoined the party on 26 July as member 3,680. 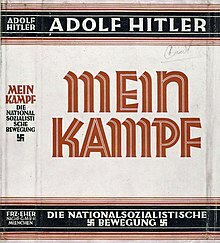 Hitler continued to face some opposition within the NSDAP: Opponents of Hitler in the leadership had Hermann Esser expelled from the party, and they printed 3,000 copies of a pamphlet attacking Hitler as a traitor to the party. 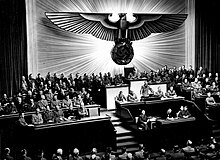 [lower-alpha 3] In the following days, Hitler spoke to several packed houses and defended himself and Esser, to thunderous applause. 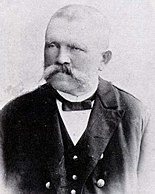 His strategy proved successful, and at a special party congress on 29 July, he was granted absolute powers as party chairman, replacing Drexler, by a vote of 533 to 1. 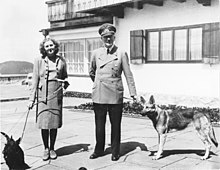 After midnight on the night of 28–29 April, Hitler married Eva Braun in a small civil ceremony in the Führerbunker. 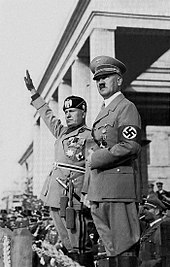 [lower-alpha 4] Later that afternoon, Hitler was informed that Mussolini had been executed by the Italian resistance movement on the previous day; this presumably increased his determination to avoid capture. ↑ The position of "Führer" ("Leader") replaced the position of "President", which was the Head of State for the Weimar Republic. 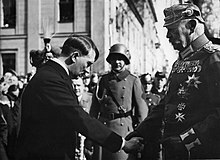 Hitler took this title after the death of Paul von Hindenburg, who had been serving as President. 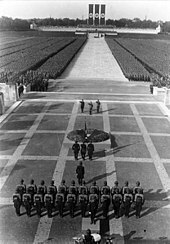 He was afterwards both Head of State and Head of the Government, with the full official title of Führer und Reichskanzler des deutschen Volkes ("Führer and Reich Chancellor of the German People"). ↑ The successor institution to the Realschule in Linz is Bundesrealgymnasium Linz Fadingerstraße. ↑ Hitler also won settlement from a libel suit against the socialist paper the Münchener Post, which had questioned his lifestyle and income. Kershaw 2008, p. 99. 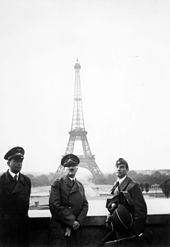 ↑ MI5, Hitler's Last Days: "Hitler's will and marriage" on the website of MI5, using the sources available to Trevor-Roper (a World War II MI5 agent and historian/author of The Last Days of Hitler), records the marriage as taking place after Hitler had dictated his last will and testament. ↑ For a summary of recent scholarship on Hitler's central role in the Holocaust, see McMillan 2012. 1 2 Shirer 1960, pp. 226–227. 1 2 Overy 2005, p. 63. ↑ Bullock 1999, p. 24. ↑ Maser 1973, p. 4. ↑ Maser 1973, p. 15. 1 2 Kershaw 1999, p. 5. ↑ Jetzinger 1976, p. 32. ↑ Rosenbaum 1999, p. 21. ↑ Hamann 2010, p. 50. ↑ Toland 1992, pp. 246–247. ↑ Kershaw 1999, pp. 8–9. ↑ Giblin 2002, p. 4. 1 2 Kershaw 2008, p. 4. ↑ Toland 1976, p. 6. ↑ Rosmus 2004, p. 33. ↑ Keller 2010, p. 15. ↑ Hamann 2010, pp. 7–8. ↑ Kubizek 2006, p. 37. ↑ Kubizek 2006, p. 92. ↑ Hitler 1999, p. 6. ↑ Fromm 1977, pp. 493–498. ↑ Shirer 1960, pp. 10–11. ↑ Payne 1990, p. 22. ↑ Kershaw 2008, p. 9. ↑ Hitler 1999, p. 8. ↑ Keller 2010, pp. 33–34. ↑ Fest 1977, p. 32. ↑ Kershaw 2008, p. 8. ↑ Hitler 1999, p. 10. ↑ Evans 2003, pp. 163–164. ↑ Bendersky 2000, p. 26. ↑ Ryschka 2008, p. 35. ↑ Hamann 2010, p. 13. ↑ Kershaw 2008, p. 10. ↑ Kershaw 1999, p. 19. ↑ Kershaw 1999, p. 20. 1 2 Hitler 1999, p. 20. ↑ Bullock 1962, pp. 30–31. ↑ Bullock 1962, p. 31. ↑ Bullock 1999, pp. 30–33. ↑ Hamann 2010, p. 157. ↑ Kershaw 1999, pp. 41, 42. ↑ Shirer 1960, p. 26. ↑ Hamann 2010, pp. 243–246. ↑ Nicholls 2000, pp. 236, 237, 274. ↑ Hamann 2010, p. 250. ↑ Hamann 2010, pp. 341–345. ↑ Hamann 2010, p. 233. ↑ Kershaw 1999, pp. 60–67. ↑ Shirer 1960, p. 25. ↑ Hamann 2010, p. 58. ↑ Hitler 1999, p. 52. ↑ Toland 1992, p. 45. ↑ Kershaw 1999, p. 55,63. ↑ Hamann 2010, p. 174. ↑ Shirer 1960, p. 27. ↑ Weber 2010, p. 13. ↑ Kershaw 1999, p. 86. ↑ Kershaw 1999, p. 49. 1 2 3 Kershaw 1999, p. 90. ↑ Weber 2010, pp. 12–13. ↑ Kershaw 2008, p. 53. ↑ Kershaw 2008, p. 54. ↑ Weber 2010, p. 100. 1 2 Shirer 1960, p. 30. ↑ Kershaw 2008, p. 59. ↑ Steiner 1976, p. 392. ↑ Kershaw 2008, p. 57. ↑ Kershaw 2008, p. 58. ↑ Kershaw 2008, pp. 59, 60. ↑ Kershaw 1999, pp. 97, 102. ↑ Keegan 1987, pp. 238–240. ↑ Bullock 1962, p. 60. ↑ Kershaw 2008, pp. 61, 62. ↑ Kershaw 2008, pp. 61–63. ↑ Kershaw 2008, p. 96. ↑ Kershaw 2008, pp. 80, 90, 92. ↑ Bullock 1999, p. 61. ↑ Kershaw 1999, p. 109. ↑ Kershaw 2008, p. 82. ↑ Evans 2003, p. 170. ↑ Kershaw 2008, pp. 75, 76. ↑ Mitcham 1996, p. 67. ↑ Kershaw 1999, pp. 125–126. ↑ Fest 1970, p. 21. ↑ Kershaw 2008, pp. 94, 95, 100. ↑ Kershaw 2008, p. 87. ↑ Kershaw 2008, p. 88. ↑ Kershaw 2008, p. 93. ↑ Kershaw 2008, p. 89. ↑ Kershaw 2008, pp. 89–92. ↑ Kershaw 2008, pp. 100, 101. ↑ Kershaw 2008, p. 102. 1 2 Kershaw 2008, p. 103. ↑ Kershaw 2008, pp. 83, 103. ↑ Kershaw 2000b, p. xv. ↑ Bullock 1999, p. 376. ↑ Kershaw 2008, pp. 105–106. ↑ Bullock 1999, p. 377. ↑ Kressel 2002, p. 121. ↑ Heck 2001, p. 23. ↑ Kellogg 2005, p. 275. ↑ Kellogg 2005, p. 203. ↑ Bracher 1970, pp. 115–116. ↑ Bracher 1970, pp. 20,165. ↑ Kershaw 2008, p. 126. 1 2 Kershaw 2008, p. 128. ↑ Kershaw 2008, p. 129. ↑ Kershaw 2008, pp. 130–131. ↑ Shirer 1960, pp. 73–74. ↑ Kershaw 2008, p. 132. ↑ Kershaw 2008, p. 131. ↑ Fulda 2009, pp. 68–69. ↑ Kershaw 1999, p. 239. 1 2 Bullock 1962, p. 121. ↑ Kershaw 2008, p. 147. ↑ Kershaw 2008, pp. 148–150. ↑ Shirer 1960, pp. 80–81. ↑ Kershaw 1999, p. 237. 1 2 Kershaw 1999, p. 238. ↑ Kershaw 2008, pp. 158, 161, 162. ↑ Kershaw 2008, pp. 162, 166. ↑ Shirer 1960, p. 129. ↑ Kershaw 2008, pp. 166, 167. ↑ Shirer 1960, pp. 136–137. ↑ Kolb 2005, pp. 224–225. ↑ Kolb 1988, p. 105. ↑ Halperin 1965, p. 403 et. seq. ↑ Halperin 1965, pp. 434–446 et. seq. ↑ Wheeler-Bennett 1967, p. 218. ↑ Wheeler-Bennett 1967, p. 216. ↑ Wheeler-Bennett 1967, pp. 218–219. ↑ Wheeler-Bennett 1967, p. 222. ↑ Halperin 1965, p. 449 et. seq. ↑ Halperin 1965, pp. 434–436, 471. 1 2 Shirer 1960, p. 130. ↑ Halperin 1965, p. 476. ↑ Halperin 1965, pp. 468–471. ↑ Bullock 1962, p. 201. ↑ Kershaw 2008, p. 227. ↑ Halperin 1965, pp. 477–479. ↑ Letter to Hindenburg, 1932. ↑ Shirer 1960, p. 184. ↑ Evans 2003, p. 307. ↑ Bullock 1962, p. 262. ↑ Kershaw 1999, pp. 456–458, 731–732. ↑ Shirer 1960, p. 192. ↑ Bullock 1999, p. 262. ↑ Shirer 1960, pp. 194, 274. ↑ Shirer 1960, p. 194. ↑ Bullock 1962, p. 265. ↑ Shirer 1960, pp. 196–197. ↑ Shirer 1960, p. 198. ↑ Evans 2003, p. 335. ↑ Shirer 1960, p. 196. ↑ Bullock 1999, p. 269. ↑ Shirer 1960, p. 199. 1 2 Shirer 1960, p. 201. ↑ Shirer 1960, p. 202. 1 2 Evans 2003, pp. 350–374. ↑ Kershaw 2008, pp. 309–314. ↑ Tames 2008, pp. 4–5. ↑ Kershaw 2008, pp. 313–315. ↑ Evans 2005, p. 44. ↑ Shirer 1960, p. 229. ↑ Bullock 1962, p. 309. ↑ Evans 2005, p. 110. ↑ Kershaw 2008, pp. 392, 393. ↑ Shirer 1960, p. 312. ↑ Kershaw 2008, pp. 393–397. ↑ Shirer 1960, p. 308. ↑ Shirer 1960, pp. 318–319. ↑ Kershaw 2008, pp. 397–398. ↑ Shirer 1960, p. 274. ↑ Read 2004, p. 344. ↑ Evans 2005, pp. 109–111. ↑ McNab 2009, p. 54. ↑ Shirer 1960, pp. 259–260. ↑ Shirer 1960, p. 258. ↑ Shirer 1960, p. 262. ↑ McNab 2009, pp. 54–57. ↑ Speer 1971, pp. 118–119. ↑ Evans 2005, pp. 570–572. ↑ Weinberg 1970, pp. 26–27. ↑ Kershaw 1999, pp. 490–491. ↑ Kershaw 1999, pp. 492, 555–556, 586–587. ↑ Carr 1972, p. 23. ↑ Kershaw 2008, p. 297. ↑ Shirer 1960, p. 283. ↑ Messerschmidt 1990, pp. 601–602. ↑ Hildebrand 1973, p. 39. ↑ Messerschmidt 1990, pp. 630–631. 1 2 Overy, Origins of WWII Reconsidered 1999. ↑ Carr 1972, pp. 56–57. ↑ Messerschmidt 1990, p. 642. ↑ Aigner 1985, p. 264. 1 2 Messerschmidt 1990, pp. 636–637. ↑ Carr 1972, pp. 73–78. ↑ Messerschmidt 1990, p. 638. 1 2 Bloch 1992, pp. 178–179. ↑ Plating 2011, p. 21. ↑ Butler & Young 1989, p. 159. ↑ Bullock 1962, p. 434. ↑ Overy 2005, p. 425. ↑ Weinberg 1980, pp. 334–335. ↑ Weinberg 1980, pp. 338–340. ↑ Weinberg 1980, p. 366. ↑ Weinberg 1980, pp. 418–419. ↑ Kee 1988, pp. 149–150. ↑ Weinberg 1980, p. 419. ↑ Murray 1984, pp. 256–260. ↑ Bullock 1962, p. 469. ↑ Overy, The Munich Crisis 1999, p. 207. ↑ Kee 1988, pp. 202–203. ↑ Weinberg 1980, pp. 462–463. ↑ Messerschmidt 1990, p. 672. ↑ Messerschmidt 1990, pp. 671, 682–683. ↑ Rothwell 2001, pp. 90–91. 1 2 Murray 1984, p. 268. ↑ Murray 1984, pp. 268–269. ↑ Shirer 1960, p. 448. ↑ Weinberg 1980, p. 562. ↑ Weinberg 1980, pp. 579–581. 1 2 Maiolo 1998, p. 178. 1 2 Messerschmidt 1990, pp. 688–690. 1 2 Weinberg 1980, pp. 537–539, 557–560. ↑ Weinberg 1980, p. 558. ↑ Carr 1972, pp. 76–77. ↑ Kershaw 2000b, pp. 36–37, 92. ↑ Weinberg 2010, p. 792. ↑ Robertson 1985, p. 212. ↑ Bloch 1992, p. 228. ↑ Overy & Wheatcroft 1989, p. 56. ↑ Kershaw 2008, p. 497. ↑ Robertson 1963, pp. 181–187. ↑ Evans 2005, p. 693. ↑ Bloch 1992, pp. 252–253. ↑ Weinberg 1995, pp. 85–94. ↑ Bloch 1992, pp. 255–257. ↑ Weinberg 1980, pp. 561–562, 583–584. ↑ Bloch 1992, p. 260. 1 2 3 Rees 1997, pp. 141–145. ↑ Kershaw 2008, p. 527. ↑ Welch 2001, pp. 88–89. 1 2 3 4 Rees 1997, pp. 148–149. ↑ Winkler 2007, p. 74. ↑ Shirer 1960, pp. 696–730. ↑ Kershaw 2008, p. 562. ↑ Deighton 2008, pp. 7–9. ↑ Ellis 1993, p. 94. ↑ Shirer 1960, pp. 731–737. ↑ Shirer 1960, pp. 774–782. ↑ Kershaw 2008, pp. 563, 569, 570. ↑ Kershaw 2008, p. 580. ↑ Roberts 2006, pp. 58–60. ↑ Kershaw 2008, pp. 604–605. ↑ Kurowski 2005, pp. 141–142. ↑ Mineau 2004, p. 1. ↑ Glantz 2001, p. 9. ↑ Evans 2008, p. 202. ↑ Evans 2008, p. 210. ↑ Shirer 1960, pp. 900–901. 1 2 Bauer 2000, p. 5. ↑ Shirer 1960, p. 921. ↑ Kershaw 2000b, p. 417. ↑ Evans 2008, pp. 419–420. ↑ Shirer 1960, p. 1006. 1 2 BBC News, 1999. ↑ Shirer 1960, pp. 996–1000. ↑ Shirer 1960, p. 1036. ↑ Speer 1971, pp. 513–514. ↑ Kershaw 2008, pp. 544–547, 821–822, 827–828. ↑ Kershaw 2008, pp. 816–818. ↑ Shirer 1960, pp. 1048–1072. ↑ Bullock 1962, p. 778. ↑ Rees & Kershaw 2012. 1 2 Bullock 1962, pp. 774–775. ↑ Sereny 1996, pp. 497–498. ↑ Bullock 1962, pp. 753, 763, 780–781. ↑ Beevor 2002, p. 251. ↑ Beevor 2002, pp. 255–256. ↑ Le Tissier 2010, p. 45. 1 2 Dollinger 1995, p. 231. ↑ Beevor 2002, p. 275. ↑ Ziemke 1969, p. 92. ↑ Bullock 1962, p. 787. ↑ Bullock 1962, pp. 787, 795. ↑ Butler & Young 1989, pp. 227–228. ↑ Kershaw 2008, pp. 923–925, 943. ↑ Bullock 1962, p. 791. ↑ Bullock 1962, pp. 792, 795. ↑ Beevor 2002, p. 343. ↑ Bullock 1962, p. 798. ↑ Linge 2009, p. 199. ↑ Joachimsthaler 1999, pp. 160–182. ↑ Joachimsthaler 1999, pp. 217–220. ↑ Linge 2009, p. 200. ↑ Bullock 1962, pp. 799–800. ↑ Kershaw 2008, pp. 949–950. ↑ Vinogradov 2005, pp. 111, 333. ↑ Vinogradov 2005, pp. 335–336. ↑ Kershaw 2000b, p. 1110. ↑ Marrus 2000, p. 37. 1 2 3 Snyder 2010, p. 416. ↑ Kershaw 2008, p. 683. ↑ Shirer 1960, p. 965. ↑ Naimark 2002, p. 81. ↑ Longerich 2005, p. 116. ↑ Megargee 2007, p. 146. 1 2 Longerich, Chapter 15 2003. ↑ Longerich, Chapter 17 2003. ↑ Kershaw 2000b, pp. 459–462. ↑ Kershaw 2008, pp. 670–675. ↑ Megargee 2007, p. 144. ↑ Kershaw 2008, p. 687. ↑ Evans 2008, map, p. 366. 1 2 3 Rummel 1994, p. 112. ↑ Evans 2008, p. 318. 1 2 Holocaust Memorial Museum. ↑ Hancock 2004, pp. 383–396. ↑ Shirer 1960, p. 946. ↑ Snyder 2010, pp. 162–163, 416. ↑ Dorland 2009, p. 6. ↑ Rummel 1994, table, p. 112. ↑ Snyder 2010, p. 184. ↑ Niewyk & Nicosia 2000, p. 45. ↑ Goldhagen 1996, p. 290. ↑ Downing 2005, p. 33. ↑ Gellately 2001, p. 216. ↑ Kershaw 1999, pp. 567–568. ↑ Overy 2005, p. 252. ↑ Kershaw 2008, pp. 170, 172, 181. ↑ Speer 1971, p. 281. ↑ Manvell & Fraenkel 2007, p. 29. ↑ Kershaw 2008, p. 323. ↑ Kershaw 2008, p. 377. ↑ Speer 1971, p. 333. 1 2 Overy 2005, pp. 421–425. ↑ Kershaw 2012, pp. 169–170. ↑ Kershaw 2012, pp. 396–397. ↑ Kershaw 2008, pp. 171–395. ↑ Fest 1974, p. 753. ↑ Speer 1971, p. 617. ↑ Kershaw 2012, pp. 348–350. ↑ Toland 1992, p. 892. ↑ Kershaw 2000a, pp. 1–6. ↑ Kershaw 2000b, p. 841. ↑ Fischer 1995, p. 569. ↑ Del Testa, Lemoine & Strickland 2003, p. 83. ↑ Murray & Millett 2001, p. 554. ↑ Welch 2001, p. 2. ↑ Bazyler 2006, p. 1. ↑ Shirer 1960, p. 6. ↑ Hitler & Trevor-Roper 1988, p. xxxv. ↑ Roberts 1996, p. 501. ↑ Lichtheim 1974, p. 366. ↑ Haffner 1979, pp. 100–101. ↑ Haffner 1979, p. 100. ↑ Kershaw 2008, p. 5. ↑ Rißmann 2001, pp. 94–96. ↑ Toland 1992, pp. 9–10. 1 2 Speer 1971, pp. 141–142. ↑ Speer 1971, p. 143. 1 2 Conway 1968, p. 3. ↑ Bullock 1999, pp. 385, 389. ↑ Rißmann 2001, p. 96. ↑ Speer 1971, p. 141. ↑ Steigmann-Gall 2003, pp. 27, 108. ↑ Hitler 2000, p. 59. ↑ Hitler 2000, p. 342. ↑ Bonney 2001, pp. 2–3. ↑ Bonney 2001, p. 2. ↑ Bullock 1962, pp. 219, 389. ↑ Speer 1971, pp. 141, 171, 174. ↑ Bullock 1999, p. 729. ↑ Evans 2008, p. 508. 1 2 Bullock 1962, p. 717. ↑ Redlich 2000, pp. 129–190. ↑ Langer 1972, p. 126. ↑ Waite 1993, p. 356. ↑ Kershaw 2000a, p. 72. ↑ Kershaw 2008, pp. xxxv–xxxvi. ↑ Bullock 1999, p. 388. ↑ McGovern 1968, pp. 32–33. ↑ Linge 2009, p. Chapter 3. ↑ Proctor 1999, p. 219. ↑ Toland 1992, p. 741. ↑ Heston & Heston 1980, pp. 125–142. ↑ Heston & Heston 1980, pp. 11–20. 1 2 Kershaw 2008, p. 782. ↑ Ghaemi 2011, p. 190–191. ↑ Doyle 2005, p. 8. ↑ Linge 2009, p. 156. ↑ O'Donnell 2001, p. 37. ↑ Bullock 1999, p. 563. ↑ Kershaw 2008, p. 378. ↑ Kershaw 2008, pp. 947–948. ↑ Bullock 1962, pp. 393–394. ↑ The Daily Telegraph, 2003. Aigner, Dietrich (1985). "Hitler's ultimate aims – a programme of world dominion?". In Koch, H. W. Aspects of the Third Reich. London: MacMillan. ISBN 978-0-312-05726-8. Hancock, Ian (2004). "Romanies and the Holocaust: A Reevaluation and an Overview". In Stone, Dan. The Historiography of the Holocaust. New York; Basingstoke: Palgrave Macmillan. ISBN 978-0-333-99745-1. Messerschmidt, Manfred (1990). "Foreign Policy and Preparation for War". In Deist, Wilhelm. Germany and the Second World War. 1. Oxford: Clarendon Press. ISBN 978-0-19-822866-0. Overy, Richard (1999). "Germany and the Munich Crisis: A Mutilated Victory?". In Lukes, Igor; Goldstein, Erik. The Munich Crisis, 1938: Prelude to World War II. London; Portland, OR: Frank Cass. OCLC 40862187. Overy, Richard (1999). "Misjudging Hitler". In Martel, Gordon. The Origins of the Second World War Reconsidered. London: Routledge. ISBN 978-0-415-16324-8. Overy, Richard (2005). "Hitler As War Leader". In Dear, I. C. B.; Foot, M. R. D. Oxford Companion to World War II. Oxford: Oxford University Press. ISBN 978-0-19-280670-3. Robertson, E. M. (1985). 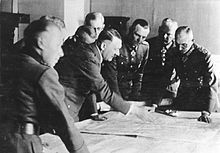 "Hitler Planning for War and the Response of the Great Powers". In H. W., Koch. 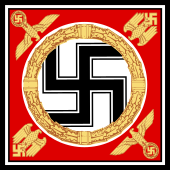 Aspects of the Third Reich. London: Macmillan. ISBN 978-0-312-05726-8. "Documents: Bush's Grandfather Directed Bank Tied to Man Who Funded Hitler". Fox News. 17 October 2003. Retrieved 1 December 2014.